If we cut a circle between two lines that cross the circle, the part that remains is an Arc. 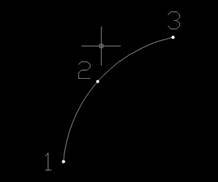 In AutoCAD an arc is a curved line of a certain radius, passing through three points. By activating the command "arc" , the program will ask as basic method, to add three points on the screen, which correspond to the starting point, the intermediate and the final point. As we have seen for the circle, once you activate the command, the “command line” show information about the execution. There are several ways that allow you to draw an arc, following many sequences and reference points different from the one described (beginning, middle, end), the image points 1, 2, 3. For example (start, end, center *) or (start, end, radius), (start, radius, angle) etc. * The center of an arc means the center of its radius. Initially, however, it is better to concentrate and understand the basic operation (start, midpoint, end). We will talk now about a feature that can be very useful for certain jobs. Draw an arc randomly as we have already tried to do... well once you draw if you press “Enter” twice, or right mouse button, then we'll draw another arc connected and then subsequent to the end point of the first. Now we can click on screen, that will be the end point of this second arc. Repeating again by double clicking the right mouse is to begin on a third arc following the second and so on, we can continue to draw consecutive arcs of different size and direction, such as curls or spirals. The interesting thing is that these arcs will be contiguous with each other, that will be perfectly connected, without angles at their points of union. This is more important in the event that the drawing made were to be exported and used as input file for processing on CNC machines. Think, for example, the design of a decoration to be carried on a glass or a marble floor, to cut according to our design, or a sheet metal to be cut by laser.